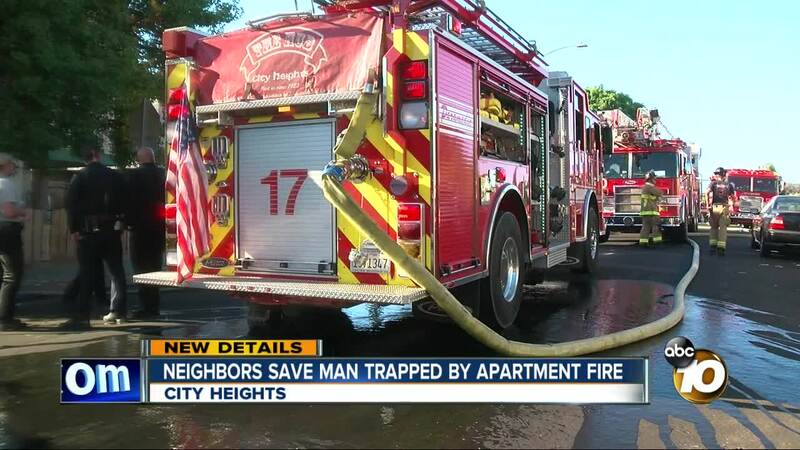 SAN DIEGO (KGTV) -- At least two people are in the hospital after an apartment caught fire near City Heights Thursday night. According to fire crews, the flames broke out in one of the units at the Estrella Avenue Apartments on the 4200 block of Estrella Avenue, just before 5 p.m. The complex houses mostly low-income veterans. Many of them worked together, when they saw one of their own in trouble. A neighbor saw the flames, punched the window, and used a fire extinguisher to hose down some of the flames in the front of the unit. The resident, also a veteran, then ran toward the back of his home. Good Samaritans who saw him dangling from a second-story window, brought a ladder, and helped him escape the flames. The arson strike team was on scene to investigate the cause of the blaze.